A technology that could eventually see every childhood vaccine delivered in a single injection has been developed by US researchers. Childhood immunisations come with tears and screams. And there are a lot of them. A team at Massachusetts Institute of Technology has designed a new type of micro-particle that could combine everything into a single jab. The particles look like miniature coffee cups that are filled with vaccine and then sealed with a lid. Other particles that last for hundreds of days have also been developed, the researchers say. Prof Robert Langer, from MIT, said: "We are very excited about this work. "For the first time, we can create a library of tiny, encased vaccine particles, each programmed to release at a precise, predictable time, so that people could potentially receive a single injection that, in effect, would have multiple boosters already built into it. "This could have a significant impact on patients everywhere, especially in the developing world." The work differs from previous attempts, which slowly released medicines over a long period of time. The idea is the short, sharp bursts of vaccine more closely mimic routine immunisation programmes. 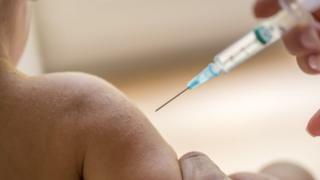 Fellow researcher Dr Kevin McHugh said: "In the developing world, that might be the difference between not getting vaccinated and receiving all of your vaccines in one shot."